Today, Lucy’s Gramps is wearing a tasselled cap, a white shirt, his red knitted waistcoat, a pleated tennis skirt, long johns and a fat pom-pom attached to each of his slippers. Today they are studying Scotland. Every Friday of the school holidays, Lucy stays at her Gramp’s house while her mum goes to work. As a retired Geography teacher, Gramps takes great delight in surprising his Granddaughter with the country they will study on that day. He greets them at the door in a costume, plays music from the country of choice and explores the globe in the morning. In the afternoon they cook food from the chosen country and do a craft activity. All this has been fun over the years but now that Lucy will soon be going to high school and has a cool friend, Briony, she would rather not go to Gramp’s house any more but hang with Briony at her Grandma’s house. Mum won’t hear of it. Everything changes one day when Lucy’s mum receives a phone call to say Gramps is in hospital having had a mild stroke. After contemplating her life without her gramps Lucy’s next move surprises us all. Especially Gramps. The recipes at the back of the book are a novel addition: I’m sure readers will give them a go. 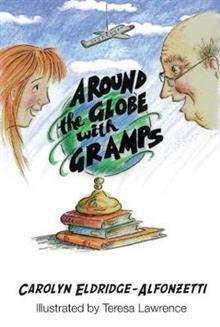 The illustrations for Around the world with Gramps are by Teresa Laurence. They are grey scale sketches depicting the characters beautifully. I especially liked the expressions on the character’s faces.